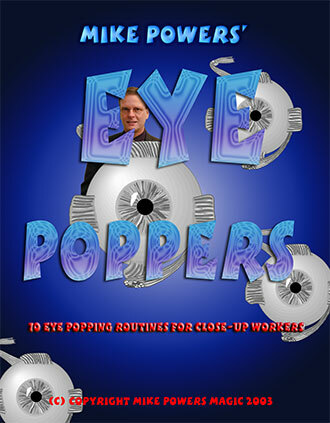 Eye Poppers is a fully illustrated set of notes containing ten solid close-up routines. Most are card items but there are two fun "games" to play with your spectators. "$185 For Your Thoughts" is a self working "game" in which the spectator apparently has many chances to win your money by making choices. In the end, the spectator merely gets his dollar back, as the final prediction states. This can be played close-up or from platform. Items include:Blind Willie Aces, Virus, Double Decker Sandwich, Schrodinger's Dream Revisited, Wild One, Goin' Fishing, DG Poker Prediction, Breathalyzer, $185 For Your Thoughts, Bouncer.